'Photogenic' (Joseph Ghio, R. 2005). Seedling# 99-164B. TB, 35" (89 cm), Midseason to late bloom. Standards rosy pink, violet midrib; falls lavender orchid becoming near blue in center; beards tangerine. 'Chasing Rainbows' X seedling# 97-54A4, pollen parent of 'Novel Idea'. Bay View 2006. Honorable Mention 2008; Award of Merit 2011. From Bay View Gardens catalog, 2006: PHOTOGENIC, 35 inches, ML. $50.00. Indeed photogenic, having appeared in our catalog and the AIS BULLETIN already. 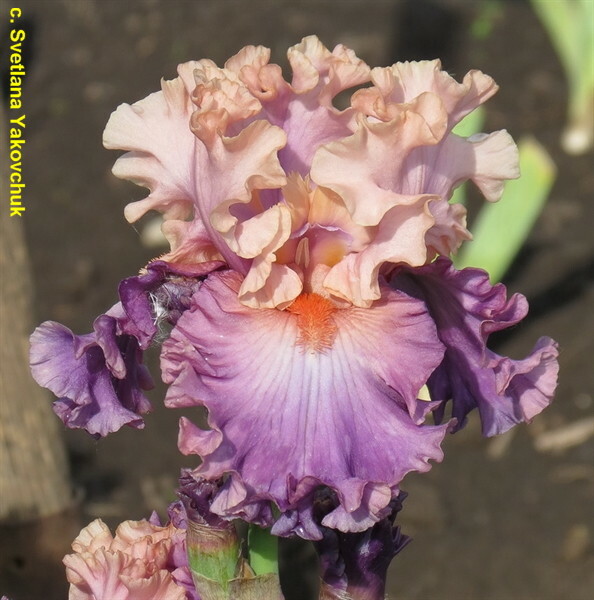 The firmly held standards are rosy pink shading to violet midribs. The wide flaring falls are lavender-orchid becoming nearly blue in the center of the petals. Pink glow in the shoulders and heart of the blossoms. Deepest bubble-ruffling, tangerine beards and show branching. No. 99-1648: Chasing Rainbows X 97-54A4, pollen parent of Novel Idea. jpg BHP_0273-X2_photogenic.jpg manage 188 K 19 Feb 2016 - 00:52 BrockHeilman Please contact Brock Heilman for image use.